22 glorious degrees. Who in their right mind not want this weather? I thought you liked the snow! -22 glorious degrees. Who in their right mind not want this weather? I do! But at this of the year when it is supposed to be ♨, I will take 22. I would love to see -22 now! 0 glorious kelvin. Who in their right mind not want this weather? Fair enough. Saturday is meant to be a hot one . Ok seriously, is Philippines more notable for being a place that doesn't stop talking about the weather,, even more so than Canada? I think so! I wonder why hot days lack this year. NO 30s. Sandikosh is happy I bet! Mid 20's ain't hot. When it hit 30's, then it is hot. PayPal me $300 and I will send you an a/c. Not going to happerd. The Phillipines is hot like a desert. A polar vortex will only turn into a hurricane as it approaches land. No cold is cold enough to cool the Phillipines. I need to take an edge of this heat! But also Remember that here tropical cyclones are actually called typhoons only. I noticed rain is really lacking here, but clouds are present most of the day, removing some of the strong effect of the sun. El nino is doing the work I had expected: making it not rain during the rainy season. 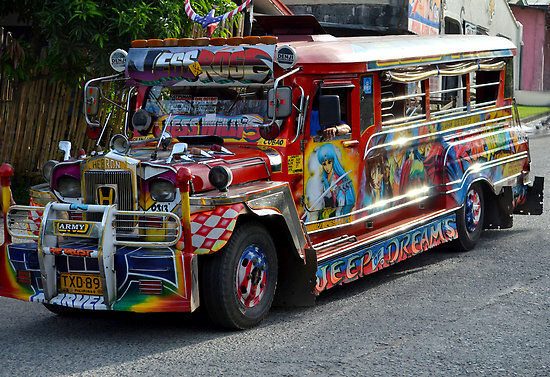 Jeepney without AC anyone ? Its not even rainy season yet. they told me it started at start of June. But whatever is goin on, I did not deal with rain since I moved to this country.